NOSE: Not a great nose for a Dubbel. Mostly candi sugar, molasses, and roasted malts. A touch of fruit and spice, but far less than you would hope for in the style. Very subdued and faint. TASTE: Sweet caramel up front and more fruit in the taste than in the nose. The middle actually has an oddly citrus bite like there are some hops coiled up in there waiting to strike like a cobra, but then fainting like a goat. Finish is strangely clean and grassy like a lager. To be honest, it’s kind of a mess. MOUTHFEEL: Really good mouthfeel. Medium-bodied, but fluffy and fizzy. DRINKABILITY: Not a lot of alcohol burn or huge flavors, so it’s actually somewhat drinkable. But it’s too scattershot to really enjoy. 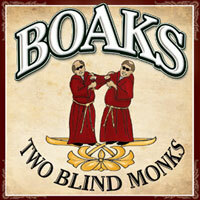 Posted in Tasting Notes.Tagged Boak's, Dubbel, Eulogy Belgian Tavern, Two Blind Monks.